If you’re a content producer, you no doubt understand the importance of getting your content in front of as many eyes as possible. A large part of this effort goes into producing your content so it can be viewed online through computers, smartphones and tablets. While this makes up a large segment of streaming traffic, there is a growing segment of users that still want to access your content, but want to view it from the comforts of their own homes. The technology that allows users to view streaming content from a television is called IPTV. IPTV or Internet Protocol Television is the act of providing streaming content to users by way of their televisions. If you’ve ever watched content on Netflix, Hulu or Amazon through your television at home, you’ve experienced IPTV. This new method of distributing video content has grown significantly as high speed Internet access has become easier and more affortable to obtain. Another factor that has helped IPTV grow is the low cost of accessing content when compared to expensive options from cable and satellite companies. TikiLIVE offers a fully featured IPTV solution that can allow you to instantly stream your content to a variety of IPTV devices. Below, we’ll discuss a few of the features that should make TikiLIVE a great choice for all of your IPTV needs. And the list is continuously growing. We believe one way to indirectly grow our user base is through offering our Set Top Box APK to manufacturers for absolutely free. For this reason manufacturers are choosing to use our software as opposed to having to go to the expense of creating inferior software in-house. Manufacturers that use our software are able to focus on creating the highest quality set top box possible, while we focus on what we do best – creating top-notch streaming software. As IPTV grows in popularity, manufacturers have began creating fully functional set top boxes that can fit in the palm of your hand. These STBs are often called dongles or streaming sticks and simply connect to the HDMI port on most TVs. These portable devices allow consumers to literally take their IPTV experience wherever they would like provided that they have an Internet connection. Some of the popular devices supported by TikiLIVE’s Set Top Box APK include the Chromecast and the Roku Streaming Stick. 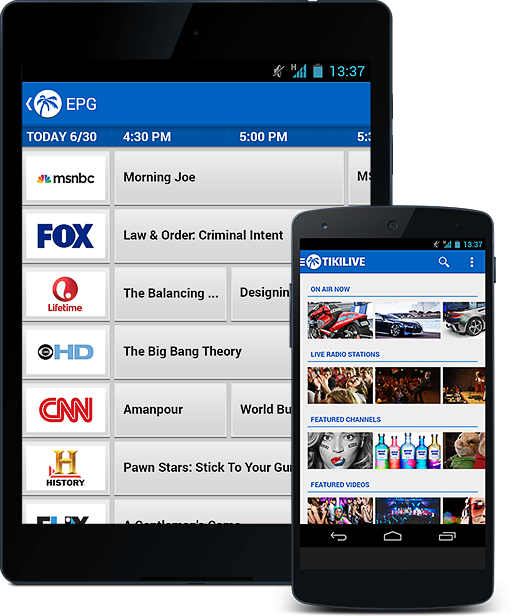 Another benefit of using TikiLIVE software to access IPTV content is our easy to use electronic program guide (EPG). Think of this guide as an upgraded version of the cable guide that you’re no doubt familiar with. Most cable and satellite programming guides are notoriously slow and cause much frustration among their users. 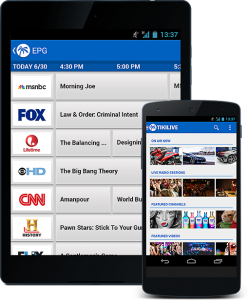 At TikiLIVE we vowed to solve this problem by completely redesigning our EPG from the ground up. Our EPG is built for speed and ease of use. While it’s great for your viewers to be able to access your content from the comforts of their living room, what happens when they leave the house and want to access your content from their mobile devices? Well, if you partner with TikiLIVE you’ll be covered when it comes to mobile devices, too. Using the latest HTML5 technology, TikiLIVE offers full support for mobile phones and tablets. Your users will receive the same high level viewing experience whether they watch your content from their homes or while on the go using their mobile devices. With the huge spike in mobile Internet usage it’s important that your content is accessible from these types of devices or you could risk alienating your audience. The quality of your content doesn’t really matter if the infrastructure that is delivering it is subpar. With TikiLIVE’s decade of experience in the industry we’ve been able to build a content delivery network that is unmatched in the market. If you stream content online you’ve no doubt experienced issues with delays and buffering when trying to load videos. We’ve invested significant resources into building a network that helps to limit some of these common issues seen with streaming providers. The reality is that if your content is experiencing streaming issues your audience is likely to look elsewhere. We know that you don’t want this to happen and neither do we. We have a network of rock solid servers located in various regions across the world that offer an incredibly reliable network by which to stream your content. Are You Ready to Join the Streaming Revolution? If you think you’re ready to begin streaming your content online to millions of users through TikiLIVE’s network, don’t hesitate to reach out to our experienced team today. We can help you with everything from setting up an account to using our updated Free Set Top Box APK. Whatever your streaming needs may be we have the knowledge to turn your dreams into reality. Pick up the phone and call us today at 305-743-6722 or fill out our online email form and we’ll be in touch shortly.